I can’t remember the last time I was reading (and listening to) just one book and actively knitting on just one project. 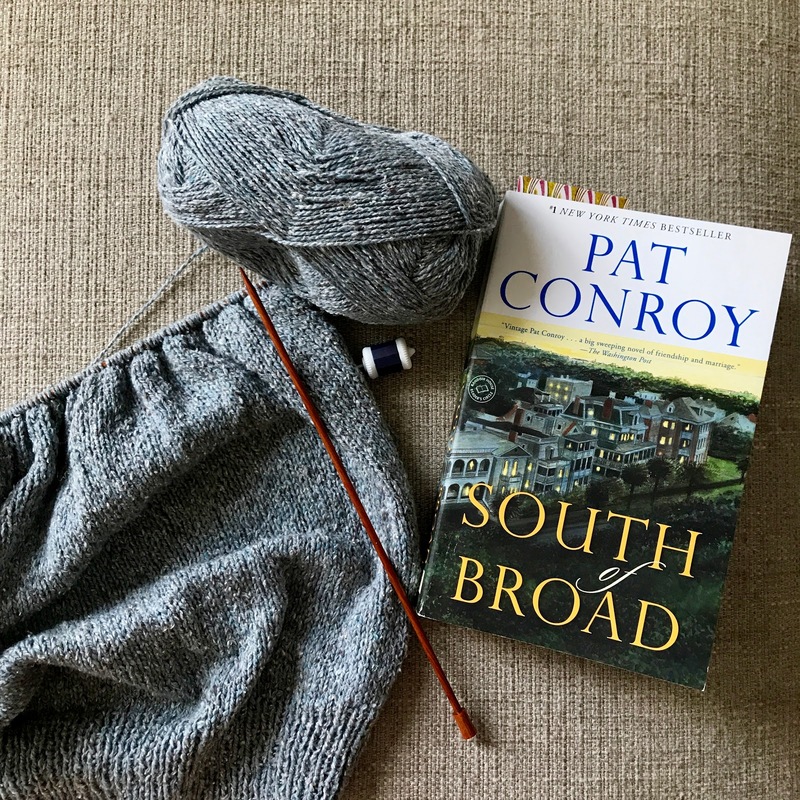 South of Broad is really that good … and the sweater, well, it’s probably going to take a back seat to the mystery shawl tomorrow morning (when the last clue comes out), but for today, it has my complete attention! Joining in with Kat and looking forward to seeing what y’all are reading and knitting this week. Love your grey yarn. Is this one of the sweaters for Alaska??? As you know, I am also reading South of Broad and enjoying. Conroy's way with words is so beautiful. Having spent some time (very, very brief – like in business trips) in Charleston and knowing some folks who live there has also made it a fun read. Seems like an awful lot of my friends are reading South of Broad! Hooray! I can't wait to delve more deeply into the Mystery shawl. It's so beautiful (so far)! Pat Conroy is not my favorite author, but I'm really basing that only on my reaction to Prince of Tides. I might have to join the crowd (after I read your review :-)) and try South of Broad. That gray is gorgeous and your focus is admirable! that gray is the gray I love. Well any gray! Would you believe I used to dislike that color in my youth? Crazy. Done with the knit piece and the book? Since you had no interferences Wednesday? ;-)).